Dressers There are 79 products. 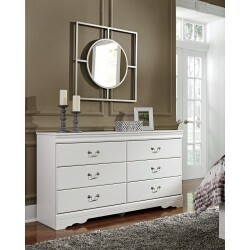 A dresser dressed to impress with wonderfully rich details made comfortably affordable. Glossy faux marble top is simply over the top, while rope twist accents and bail pulls in a satin nickel-tone finish make for a beautifully coordinated ensemble. It's hard to say what stands out most about this dresser. Its glossy finish, metallic scroll moulding, faux marble top and intricate handles are all shining stars. A bright addition to traditional or Hollywood regency decor. It's fair to say this dresser blends the very best of traditional style. Faux marble top, replicated cherry wood finish, ornate hardware and scroll moulding are all classics in their own right. Modern luxury holds your clothes. 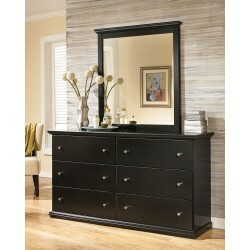 This dresser accentuates beauty through all of its facets. Beveled mirror accents under the top moulding and a sleek finish grab your attention. When opening the top drawers, the dazzling faux crystal drawer knobs and outer faux leather draw you in. Four other drawers decorated with faux crystal handles provide more storage. 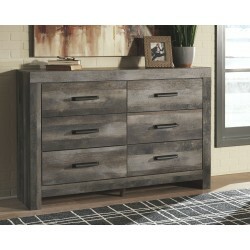 This dresser is sure to win your heart with its daring, designer take on modern rustic style. The dresser's crisp, clean and minimalist-chic profile is enriched with planked replicated oak grain, treated to a weathered gray finish for that much more authentic character. Large-scale hooded pulls gracing the flush-mount drawers add such a distinctive twist. A dark finish and clean lines allow this dresser to fit with many types of decor. Though it's classic contemporary, it's also right at home among vintage furnishings. Six spacious drawers provide plenty of storage. Snappy satin nickel-tone knobs are a crisp complement.